Frog Feast - New Homebrew for Sale for Sega, SNK Neo Geo and many other systems! 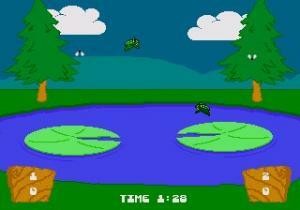 Frog Feast - Sega CD Version - 2005 (RasterSoft)File this one under "surprised". It seems that RasterSoft has developed and released Frog Feast on cartridge for the Sega Genesis (Mega Drive compatible), which is also available on Sega CD, SNK Neo Geo CD & MVS, IGM PGM and Capcom CPS-1 formats. Other versions planned include Commodore Amiga CD32, FM Towns Marty, Philips CD-I, NEC Turbo Duo and Atari Jaguar CD, though all of those have preview versions already available for download. RasterSoft has also seen fit to release the source code to several of the versions. Frog Bog - Original Intellivision Version - 1982 (Mattel)It seems the game was inspired by Mattel's original 1982 classic Frog Bog, which also spawned an Atari 2600 version called Frogs and Flies. 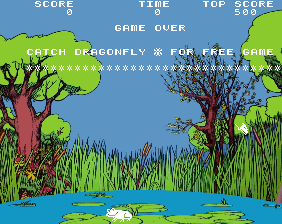 It seems though that Mattel itself was inspired by Gremlin's 1978 arcade game, Frogs, which utilized a background overlay. While is some ways Frog Feast is actually graphically less rich than the Mattel version(! ), it's refreshing to see a homebrew game inspired by something a bit different than the norm. OLDERGAMES has Frog Feast for sale in Sega CD and Neo Geo CD formats, here, as well as their usual collection of homebrew and reproduction titles that they publish and sell. 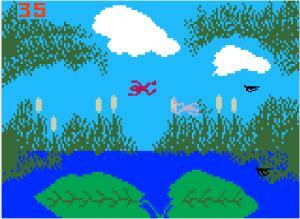 Frogs - Arcade Version - 1978 (Gremlin)You can get RasterSoft's Sega Genesis cartridge version of Frog Feast at eBay, where I first discovered it (here). To the best of my knowledge, this is among the first Sega Genesis cartridges released after the system's demise featuring original (all new) programming. I especially like the amazing multi-system approach. It's been a personal dream of mine as a collector to develop one of my own game ideas for as many systems as humanly possible. It seems that RasterSoft has already made that a reality, though of course my approach would involve computer systems, which I hope they consider. Thanks for the heads-up. Just an addition - Mattel's Frog Bog was itself a rip-off of the 1978 arcade game Frogs by Gremlin. Hey, thanks for that "martyg". I'll update the blog entry now. Frog Feast for Super Nintendo to be released on 7-17-2006 !!!!!! Charles & I personally, would like to thank you for posting this information about Frog Feast in your blog. Rastersoft for a LONG time. I believe it all started with a reset button on a C64 catridge. After that, I was hooked! As you said, the Genesis version of Frog Feast was released some months ago. The Super Nintendo version was a little tricky to do because of some sound issues we encountered. But thanks to NEVIKSTI and his SNES Sound Engine, we have overcome those obstacles. I am in the process of creating labels for the cartridges(which are a pain in the rear!) We are also updating the labels for the Genesis cartridges too. I have every version of Frog Feast for every system that it was released on. Contact me at support@chaos89.com concerning Frog Feast for the Sega Genesis/Megadrive. Frog Feast for the CD-I has been finished. just in time for CGE 2k7.